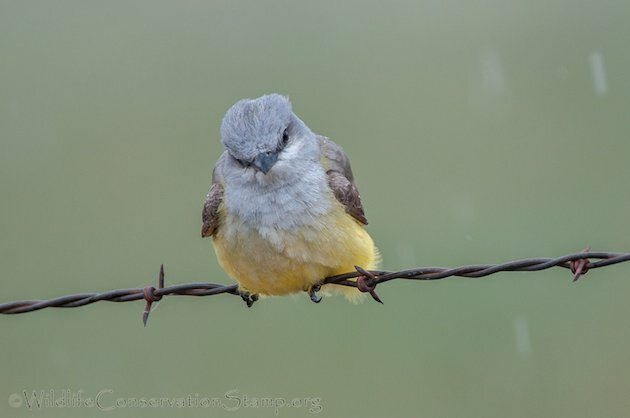 Kingbirds are named for their aggressive nature. 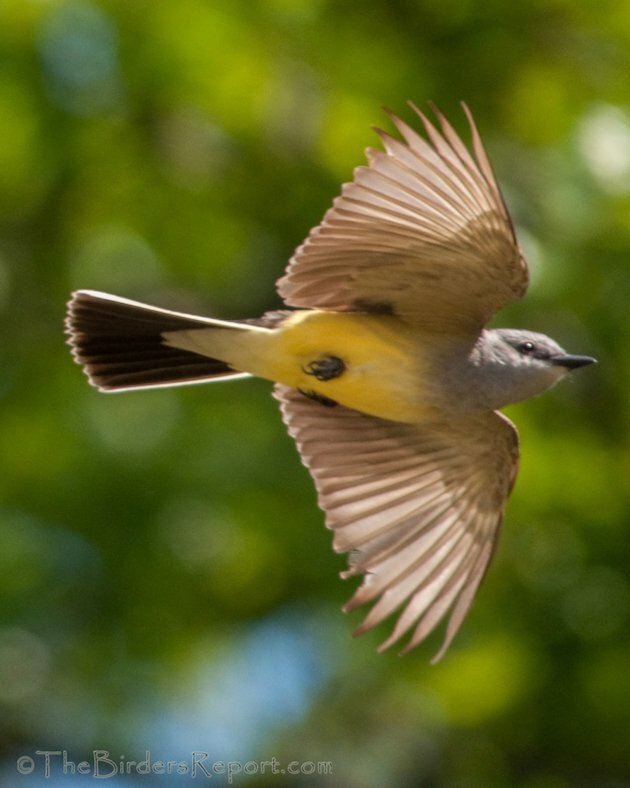 A Kingbird will defend its territory and nest against all predators, even to the point of “riding” the back of a flying hawk or crow, all the time pecking the back of its head1. 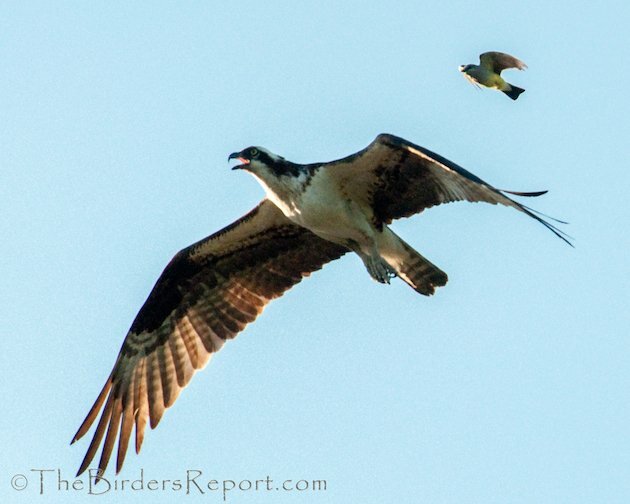 I witnessed this myself as a Western Kingbird (Tyrannus verticalis) that was possibly nesting in the bottom of an Osprey nest atop a soccer field light stand, took off after one of the Osprey nestlings on its maiden flight out of the nest. 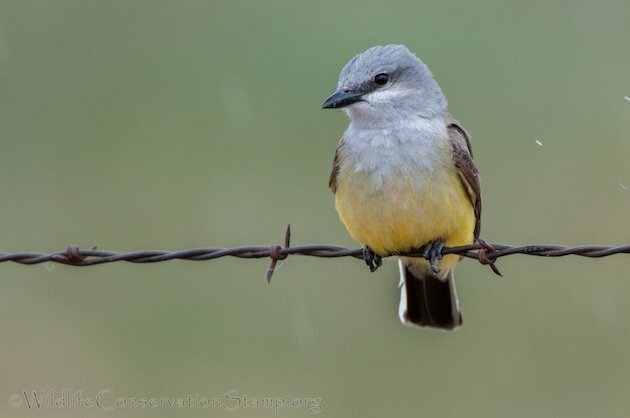 The Western Kingbird is one of eight species of tyrant flycatchers that breed in North America. They are specialized with long pointed wings for aerial hawking of insects, which make up the overwhelming majority of their diet. 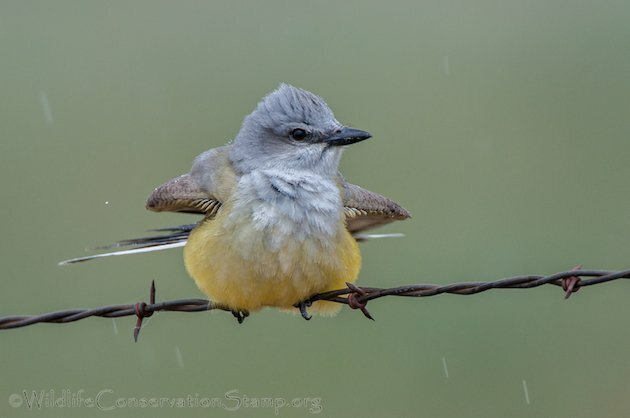 Many Kingbirds and other species that regularly hawk prey in the air have a large, broad bill that maximizes their chances of seizing at least some part of an airborne insect when they snap their bill shut. Most also have rictal bristles, an array of stiff bristles (modified feathers) around the mouth. You may be able to see them on this photo. Click on photos for full sized images. 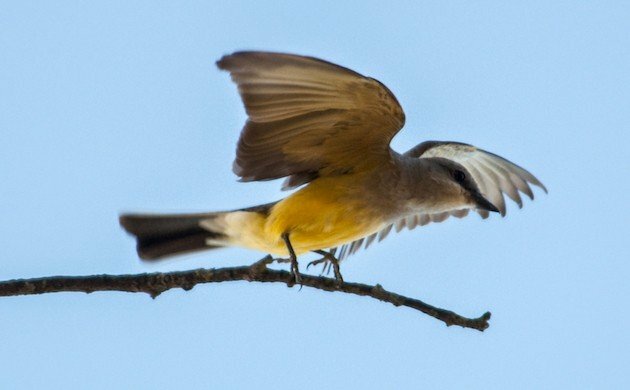 Flycatchers are fun to watch as they fly out from their prominent perch when they sight an insect, grab it in mid air and return, often to the same perch. 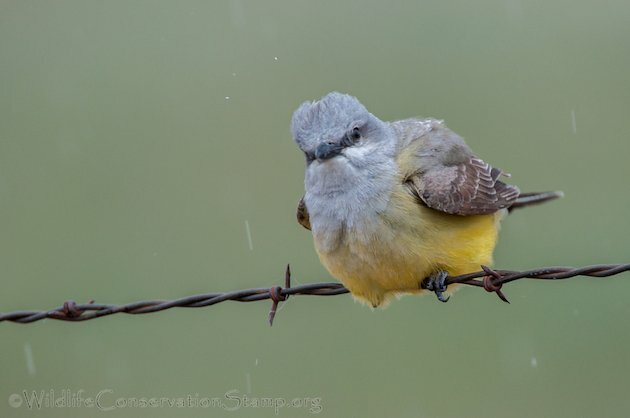 Western Kingbirds can often be seen perched on fences and wires along the roadside. 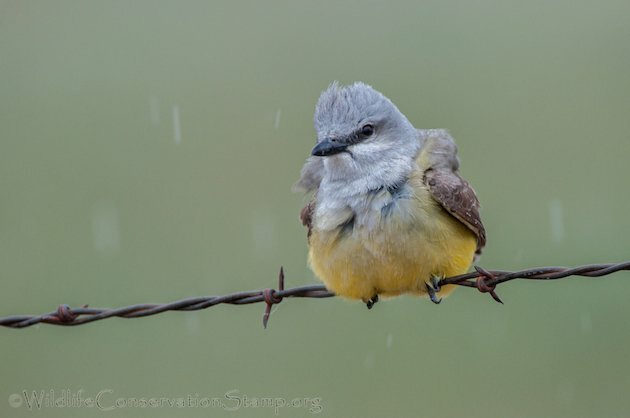 I was able to photograph this bird recently at Modoc National Wildlife Refuge as it began to rain. or maybe the bird is simply curious as to what I am doing? 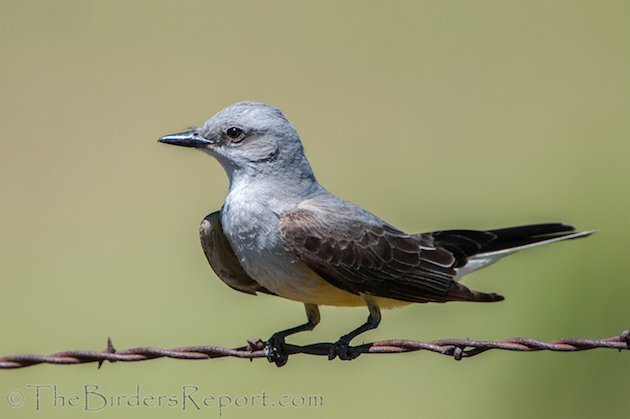 This final shot shows the white edges on the Western Kingbird’s black tail. My son find a baby western King Bird which lost her or his mother, from the moment I saw the Bird I love it, we took care of it almost for 2 weeks. Unfortunately Bird got hurt when she was flying ( her L should broke ) l took her to Lindsay Bird Hospital in Walnut Creek California for treatment, But they put her to sleep. know I miss her a lot and crying for her day and night, please tell me what should I do.